If you’re in a complicated relationship with a girl who behaves like your girlfriend, but doesn’t want to date you, you’re definitely getting led on. There’s a big difference between not being interested and playing hard to get. A lot of men mistake women saying No and they think she’s leading them on but sometimes ‘No i’m not interested’ actually means exactly that. 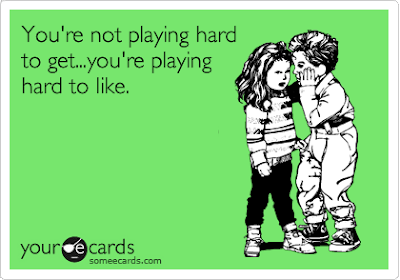 PLAY ALONG: If she can play hard to get, why can’t you? Sometimes, if a woman plays hard to get, it’s a sign that she is interested in you, so is there a better way to win than by meeting her challenge on equal terms? Make her miss you a little, now and then. Keep in mind that even when she says she’s testing you, she secretly wants the attention you’re giving her. So maybe for a few weeks, you give her that good score of attention: the calls, the witty text messages and Facebook likes and comments, and the intellectual coffee conversations. Then all of a sudden you pull out the attention little by little. You can miss the hangouts, deliberately skip a call or two, then watch her go through dating withdrawal symptoms. She could get a little paranoid if you plant hints that she’s losing you, if she continues to play hard to get for long. It’s a little devious, yes. The point is to make her realize that her life is better with you in it. CONFIDENCE IS KEY: Playing hard to get can be in different levels. It can range from the demure, daughter-of-a-pastor kind of hard to get to the straight bitchy, dismissive, and abrasive type. Women oftentimes do this to know if you’re easily intimidated and would likely crack up under the pressure. In this picture, you need to be confident and flexible. Take note of the little things such as body language, posture and mannerisms, anything you could use to your advantage. However, learn to gauge your confidence level and still be true to yourself. You don’t want to go overboard and come on too strong for her taste, or make yourself look like a poser who’s all talk. Take Will Smith in Hitch, for example. Remember, smooth and steady. PUT IN WORK: As mentioned, 70% of the dating effort falls on the shoulders of the male species. If at first she starts playing hard to get with you, it’s a cue to up your ante a little bit. Texting and instant messaging is forgivable the first few days, but you can’t get your first date with smileys alone. Man up, pick up the phone, and talk to her. It could be as simple as making her laugh, showing her interesting stuff online, and suggesting good movies that falls in her area of interest. The trick is to express genuine interest in her life. Be ready to listen if she’s upset or excited about something. Going out of your way for her sake could show her that you’re really sincere. This will make her feel that, even if she just met you a few days ago, life is a wee more cheerful with you in it. OR YOU COULD JUST ASK HER WHAT GIRLS ASK US, “WHAT ARE WE”: Choose a good time to ask her and take care not to spoil the mood. Probably after a good concert or dinner, somewhere secluded and intimate, when you two have run out of things to say. It’s a gamble, but who knows? Women appreciate honestly and sincerity the most.